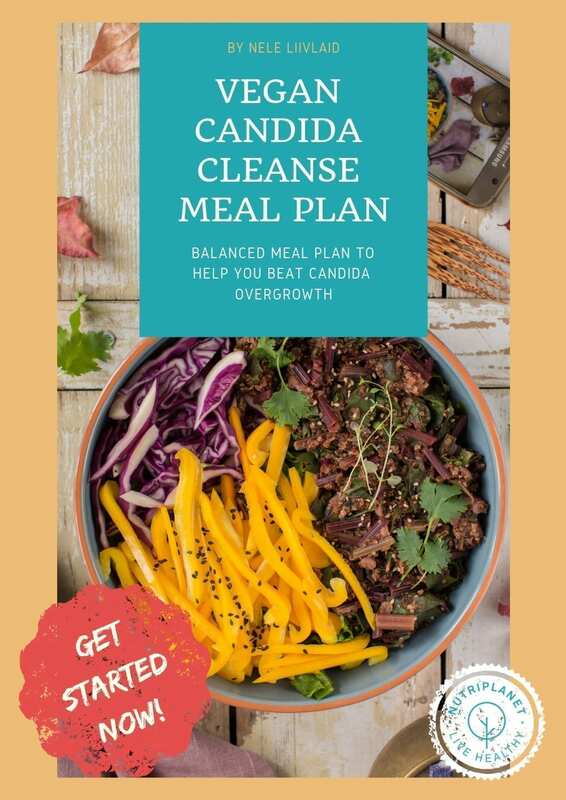 The easy to follow 1-Week Vegan Candida Cleanse Meal Plan is an instantly downloadable e-book presenting a sure-fire, holistic system for reversing your candida overgrowth and yeast infection and improve your quality of life naturally and safely within 2-4 months without drugs, side effects, or expensive treatments. Plus, FREE Private e-Mail Counselling from Me for 1 Month! Plus BONUS, Preparing Your Kitchen and Pantry including list of foods to stock at home, storing tips and necessary equipment! NEW! Tips on substitutions for those with thyroid conditions! 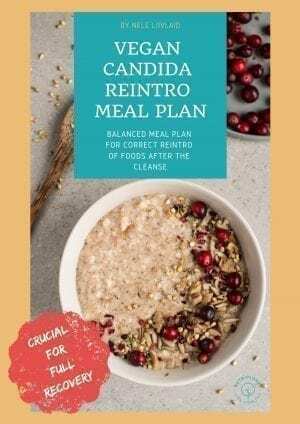 My Vegan Candida Cleanse Meal Plan is a holistic system that will teach you how to naturally cure your candida overgrowth, rebalance your body and improve your quality of life drastically. 6 steps to heal Candida overgrowth naturally. The principals of this cleanse meal plan (foods to eat, to avoid and foods that are in grey area). My personal experience/suggestions on antifungals, probiotics and other Candida cleanse supplements. How to avoid Candida die-off symptoms. 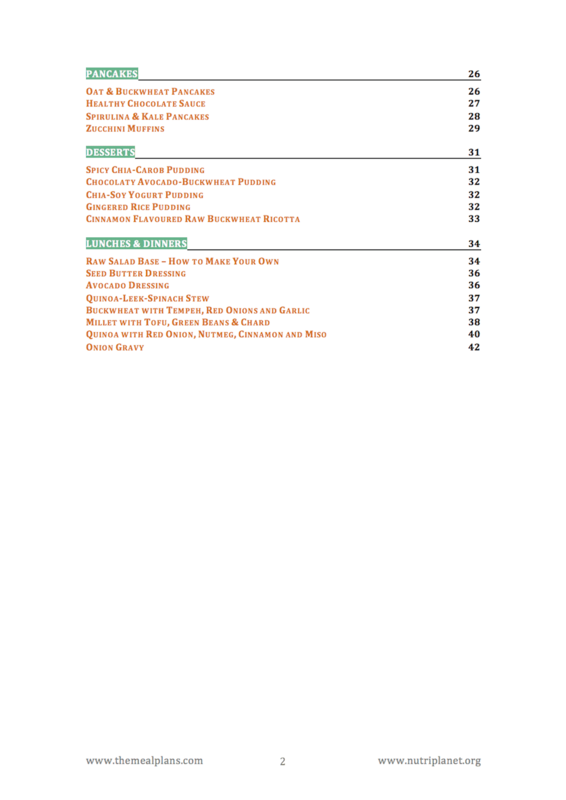 Comprehensive MEAL PREP GUIDE and shopping list. Tips on Candida cleanse drinks (other than water). Substitution tips for those with thyroid conditions. 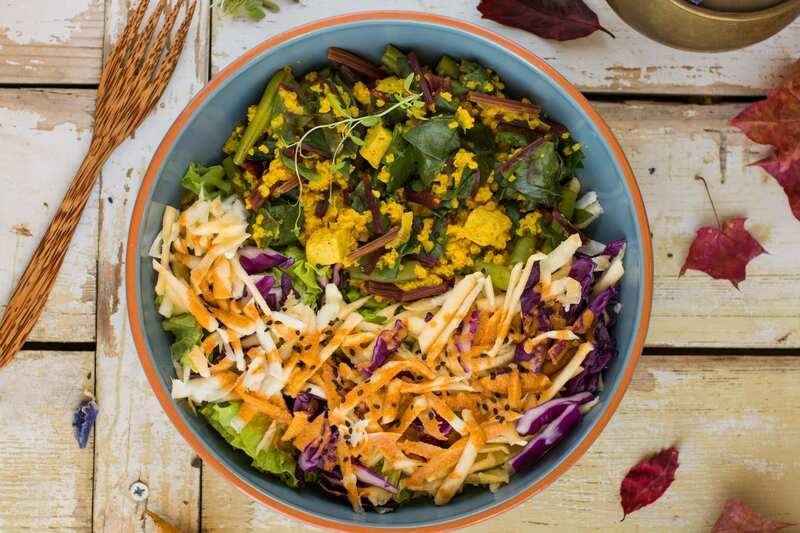 Tips on a healthy daily routine and mindful eating. Guide on how to eat more raw foods. 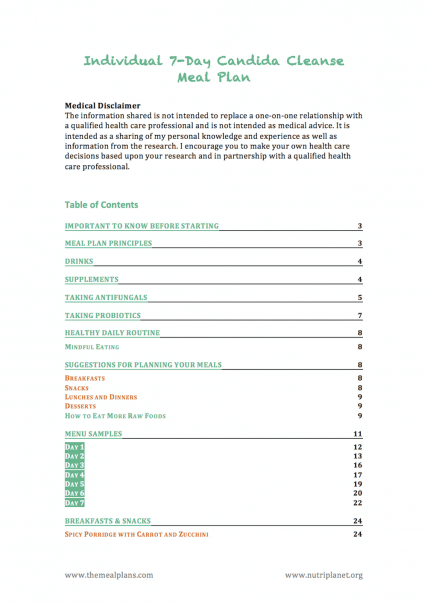 Step-by-step guide on how to compile balanced meals on Candida diet. 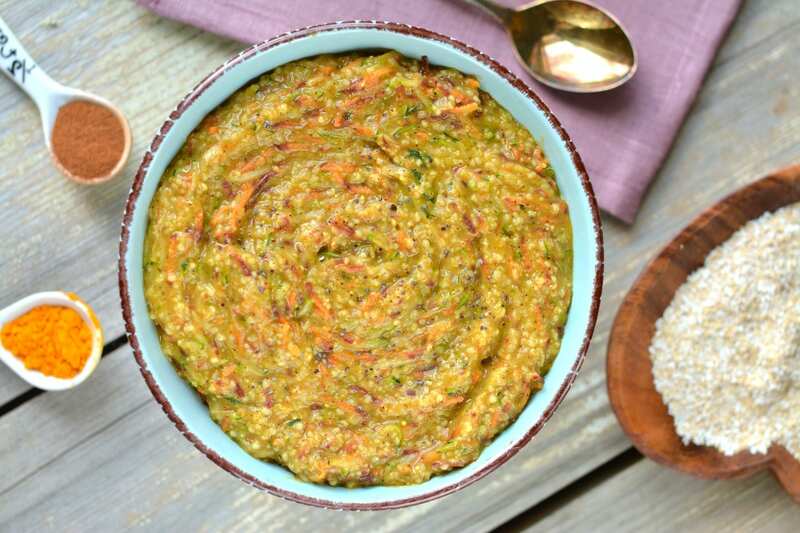 Easy-to-follow vegan Candida diet recipes for breakfasts, snacks, lunches/dinners and desserts. Extra recipes and meal ideas for Candida diet. unsweetened soy milk and natural soy yogurt. fruits and berries (fresh and dried). P.S. You’d most probably be on candida cleanse diet for longer than a week! However, you can change the sequence of the days to make the weeks different. right food combining has been taken into account as much as possible. I compiled the meals mostly in Buddha bowl style large part of them being raw non-starchy veggies. 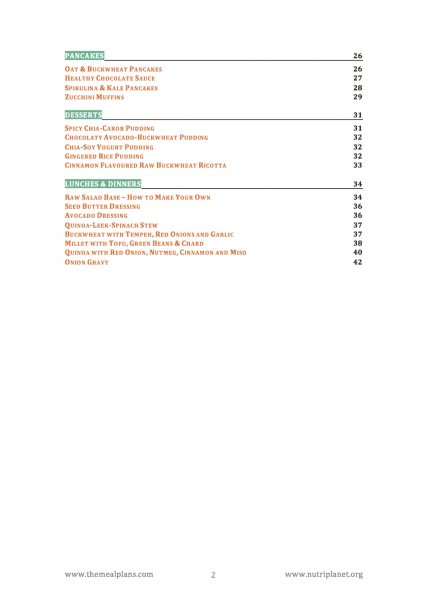 However, you’ll also find comforting soups and stews from the plan. Furthermore, I structured the meal plans in a way that you’d need to cook the main meals once a day (in the evening) and you’d have the same meal for lunch the next day (the first day being an exception). And don’t worry — you will not be on your own! You can email me at nele[at]nutriplanet.org in case of any questions, concerns or suggestions! 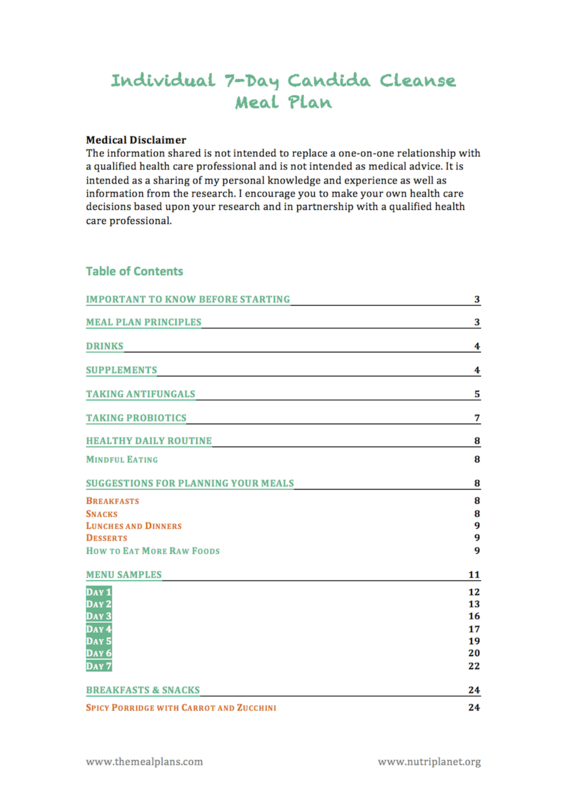 Thank you so much for the meal plan, it’s really useful and comprehensive, just what I needed, as I really don’t have the time now to research so many things. So far, the breakfast porridge & salad bowl were delicious. Even better than “non-candida-diet” food. My symptoms really reduced even in just a short amount of time (I’d say a reduction of about 60-70%). I am not following it now – I do eat a bit of fruit throughout the day, and other starchy foods. 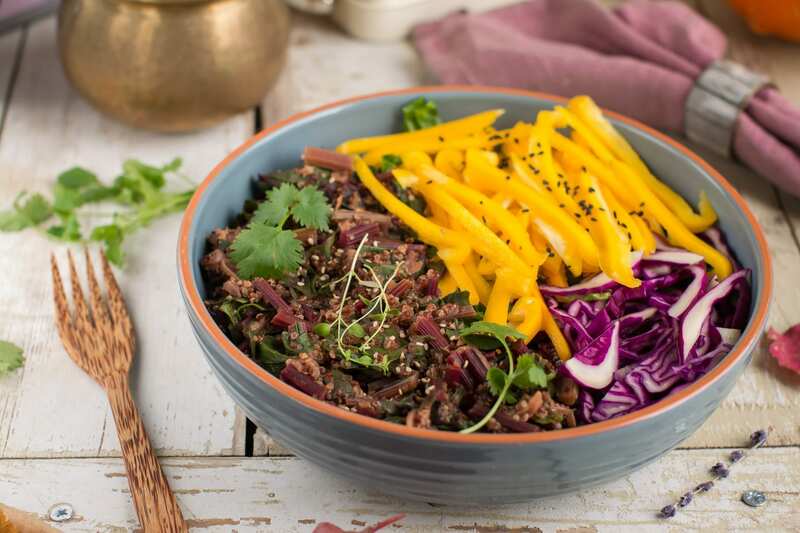 The biggest benefit I’ve taken away is that I have a sense of how to build nutritious, low sugar meals, and my eating habits have completely shifted for the better. My chronic bladder pain did return somewhat, though it’s not been anywhere near as bad as before I started. I still want to try again with some lessons learned from my first round, because I know your program works – I can’t express how grateful I am that you figured this stuff out as a vegan. 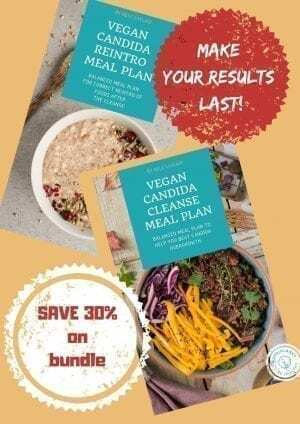 After 3 years jumping from one Diet to another, from Autoimmune program to Raw Vegan high fruit Diet, with some success, but not completely, I found Nele from Nutriplanet and I bought the vegan Candida Cleanse Meal Plan. Very good plan, different from all the others. After just 4 days I could see the difference in my symptoms. They just disappeared. Nele is always with you. She helps, she gives you advice, she answers your e-mails very quickly and all your questions in detail. The Plan came immediately after paying. It`s worth the money, believe me! I could go on and on here, but I’ll keep it short and sweet. I didn’t even realize I had a candida overgrowth issue…clueless…completely. I’ve been having some significant health issues now for about two years, that just kept staying with me, but were so broad and random that I just kept chasing solutions to the symptoms because I couldn’t get any straight answers. But then….I had these two red itchy spots come up on my arm that were slowly getting bigger. I thought…well now what??!! And that’s where the beginning of the end came to multiple symptoms ranging from uncomfortable to really painful. I started researching what the spots on my arm might be about and the search led me to eczema, which eventually led me to candida overgrowth. I was so bummed about all the “diets” to deal with it because I am vegan and they were not. Following that trail, I somehow thankfully found my way to Nele. I could not believe I found someone who had already done all the hard work, sorted it all out and made it available. Blew me away!! I would have NEVER gone through the process of trying to make this all happen on my own. One of the main things I’m so happy about is that in her plan, she’s already made sure you get all the necessary nutrients needed. That’s where I believe most of my health issues began. I was not getting everything I needed, and was getting too much of what I didn’t, creating an elevated blood sugar level, which led to extremely painful neuropathy in my feet and legs, among other things. Everything has changed. I mean EVERYTHING! Even things that I would have never in a million years associated with candida overgrowth. Shocking results actually. I couldn’t be more grateful. I feel fantastic. I’ve lost weight, which wasn’t a huge deal before, but all the puffiness, distention, swelling, inflammation is gone and therefore, the extra weight. My skin looks amazing and I’m 60 years old. My daughter visited recently and just kept saying….”Mum…your skin looks like your in your 40’s! It’s so smooth and taut!” My response ….”I know!! Crazy, isn’t it!” I’ve always believed that you are what you eat, but that statement has a whole new meaning for me. I didn’t do very well at keeping this short, but there ya go. This plan has changed my life and I’m immeasurably grateful. Deep bow of gratitude to you Nele. I was so thrilled to read this Kathy! Thank you so much for your feedback and I’m so glad I could help you! Nele’s plan helps me manage a fairly life-long relationship with Candida and related symptoms. I have become more concious of what affects my body, and what I can eat safely. 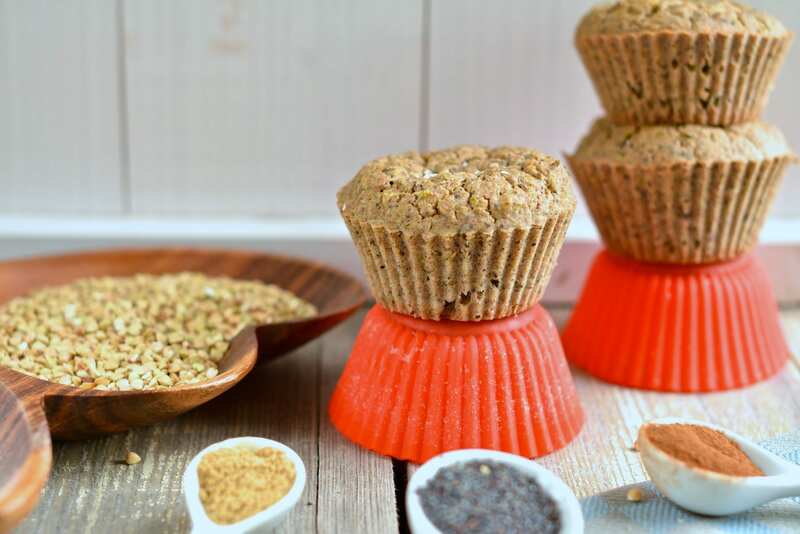 The recipies are yummy, simple to follow, and easy to modify if you have further food allergies. Thank you so much Cate! It means a world to me to know that my plan helped you on your journey to better health! 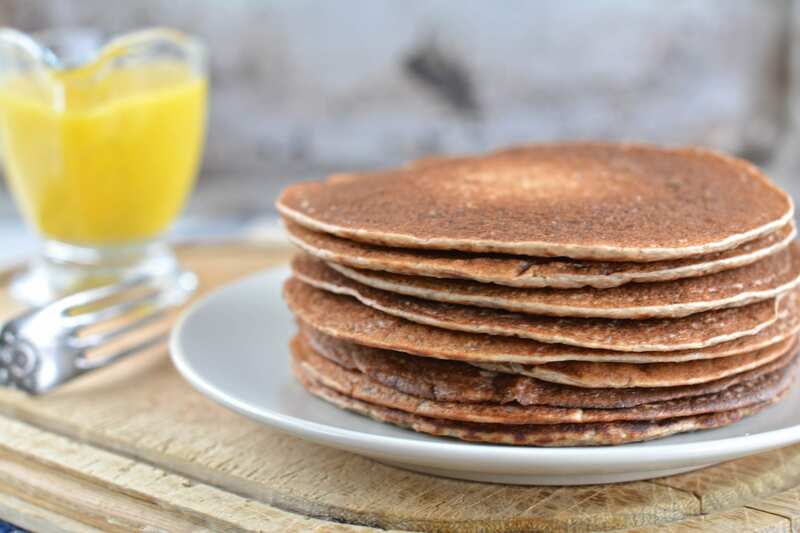 I had Candida related simptoms for a while including horrendous sugar cravings, so at first I was slightly terrified not to have anything sweet in my life. But after a few days I’ve noticed a massive relief and didn’t want any deserts at all! Also I found having more energy and requires less sleep to feel good. I’m so glad to hear that you found the meal plan helpful! Also super happy that you are feeling better! 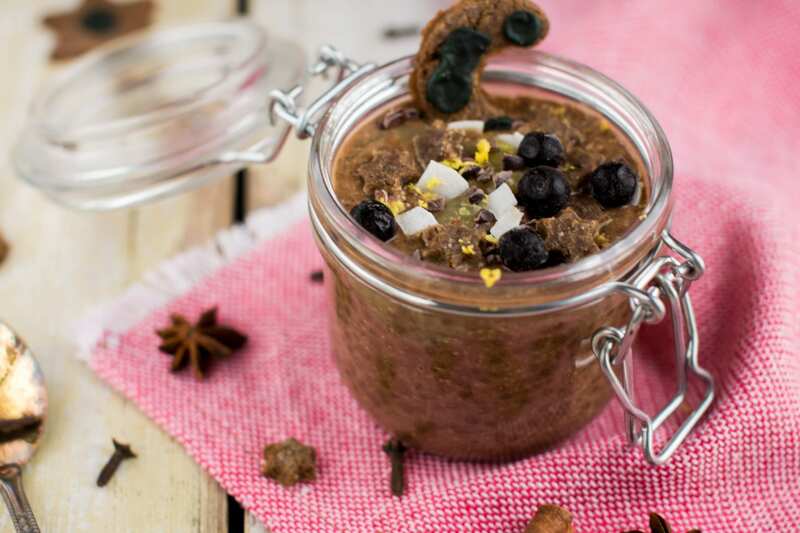 Nele’s candida cleanse, recipes and support have totally changed my relationship with food. I have learned so much – about how to eat low sugar, about food prep and how to make life easy in that and also about my own body and what it needs. My candida symptoms have gone and I feel good. And this happened very quickly. My gut feels happy now! Nele’s support has been amazing. Really prompt replies to emails. I’ve been a tricky one because of many additional food restrictions and I have to say that I was so overwhelmed by that. I just didn’t know what to do. Nele has been so helpful though. She has given me alternatives and suggestions that have shown me the path forward. I would thoroughly recommend her cleanse, reintro plan, recipes and email support to anyone. It’s all been a real life saver for me. What an heart-warming read Karen! Thank you! It’s been a privilege to consult you!